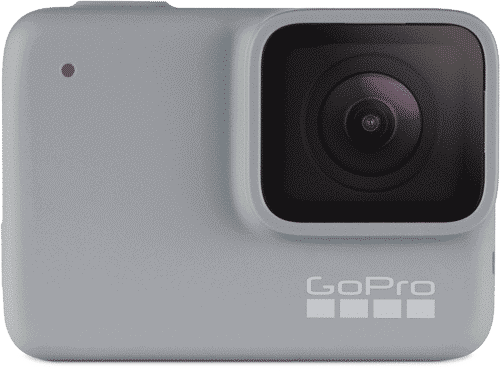 The GoPro HERO7 Silver is the middle model in the three cameras in the new HERO7 range. 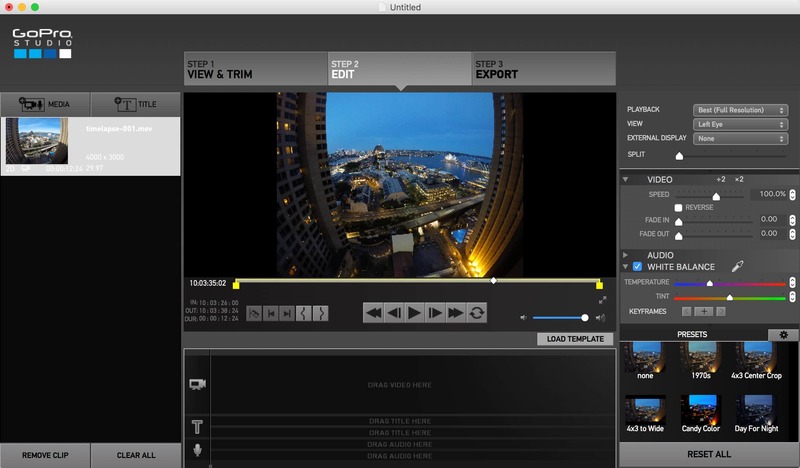 Here's a detailed rundown of its video features and options. 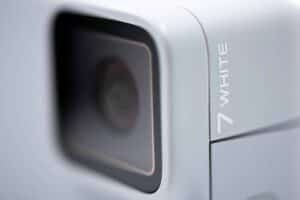 The GoPro HERO7 Silver is the middle model in the 3-camera HERO7 range. In terms of features and price, it falls between the flagship Black and the entry-level White. That's true too of its video features, which are less powerful than the Black, but a step up from very simple and limited options of the White. The short version is that Silver can shoot up to 4K, has some advanced features like in-camera electronic stabilization and exposure control, but it doesn't have the higher framerates, new HyperSmooth stabilization method, or use the higher-quality but less-compatible HEVC video codec of the Black. 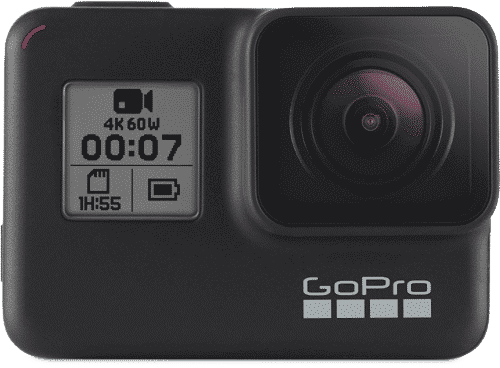 So here's a detailed rundown on the various options and features available when shooting video with the GoPro HERO7 Silver. It has one other resolution: 1440p. That's the same width as standard 1080p video, but it's taller, which gives more leeway vertically in where the camera is pointed. So it's considered HD video and is suitable for general web use. 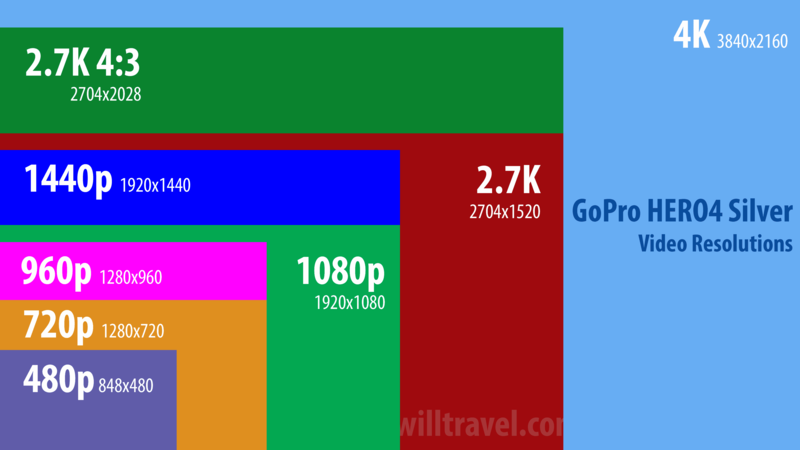 Typical HD videos on the web display at either 1080p or even the smaller 720p. Here's a visualization of how the 4K resolution compares with the 1440. 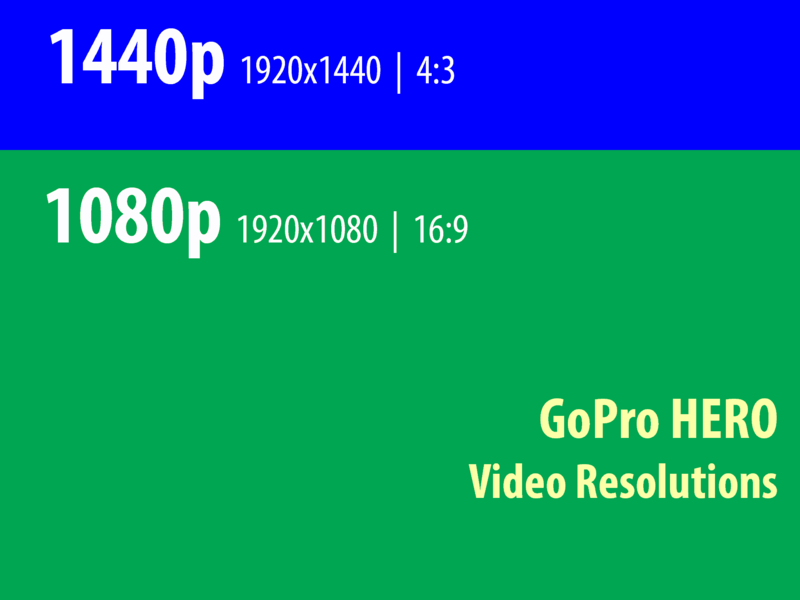 The 1440 resolution produces video that is 1920 pixels wide by 1440 pixels high, which is an aspect ratio of 4:3. 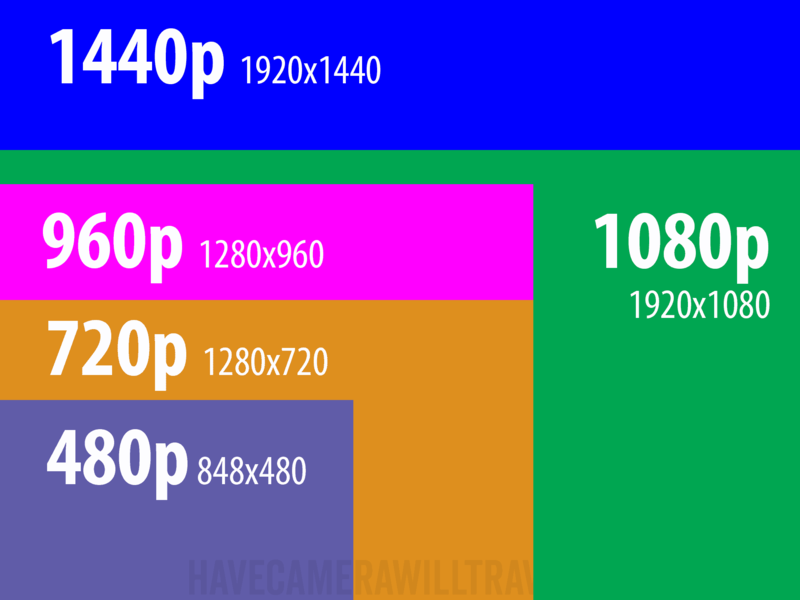 For comparison, 1080p or standard HD video is 1920 pixels wide by 1080 pixels high, which is a narrower aspect ratio of 16:9 that we've become accustomed to since HD digital TVs took over. The 4:3 aspect ratio is boxier, more typical of old-school analog TVs and analog monitors, but when you're sharing video online, 4:3 still works well. And that little extra vertical leeway can make a difference if you're trying to avoid framing someone's head out of the shot. 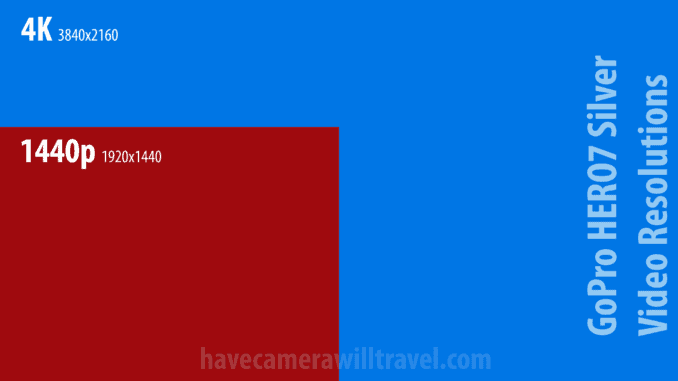 Here's a visualization of how 1440 compares with 1080 (the 1080 is the pale blue box in the middle, while the background is 1440. When you're shooting at the 1440 resolution, you have at least some choice with framerates. In NTSC format, you can choose from 60 fps or 30 fps; in PAL, it's 50 fps or 25 fps. 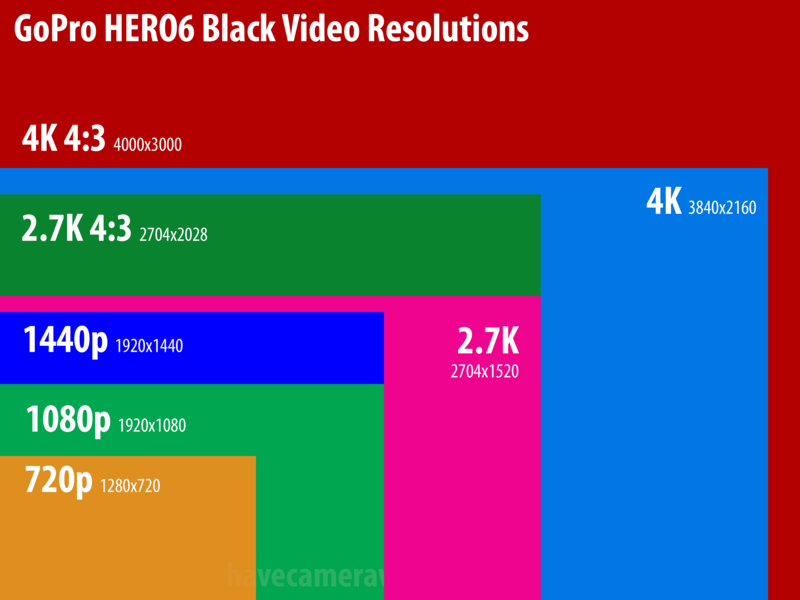 The HERO7 Silver records its video at up to 60 Mb/s. That makes it much less demanding of the speed of the SD card than the Black (up to 78 Mb/s), so you have a little more wiggle room with slightly slower or older SD cards. (I've put together some practical SD card recommendations separately). For the lower resolutions, it uses either 40 Mb/s or 30 Mb/s. 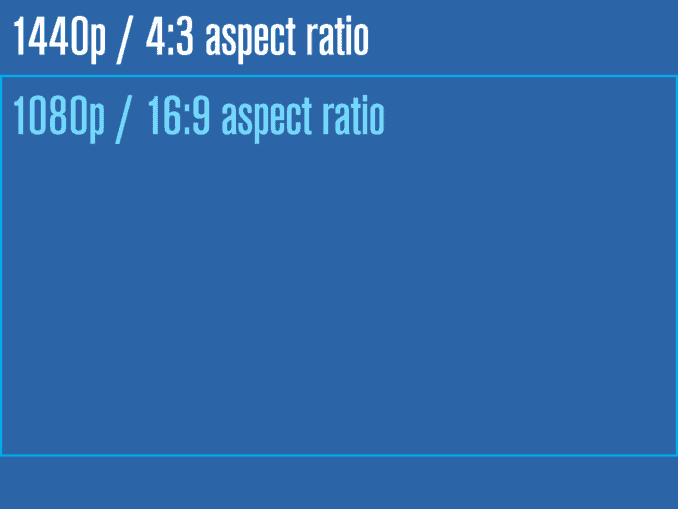 Here's a table showing which specific bitrates are used for the available resolution/framerate combinations. The encoding uses a variable bitrate compression algorithm (H.264), so the final bitrate can fluctuate a little from clip to clip. The audio track is embedded with the video stream. It's a 128 Kbps, 2-channel, AAC track, at 48 KHz. There's one field of view available in all of the Silver's video modes: Wide. It's that very wide-angle fisheye look that GoPro's are known for. There is one qualification to that, though. It's not exactly a different field of view, but you can work around the distortion at the edge of the frames by using the digital zoom feature (in 1440 resolution only). The Silver doesn't have any Protune options for video or photo modes. If you need those expert options, you'll need to step up to the Black. The Silver has built-in electronic stabilization. It's the older generation, not the latest HyperSmooth used in the Black edition. It works quite well, although the results won't be as good as if you'd used a quality external gimbal stabilizer. One thing to note is that the stabilization isn't just on by default--it's permanently on, and you can't turn it off. While that can be good for general everyday shooting, it might be an issue if you want finer control over the stabilization by using different software--using software stabilization on footage that has already been stabilized can lead to some pretty strange results. The Silver has a digital zoom feature that you can use while shooting video. It's worth knowing that this is an electronic zoom, not an optical one. But you can apply it while filming by using touch controls on the back screen using a slider. It eases in and out, but it's it's still quite clunky and not much like a smooth optical zoom, but it's there if you need it and can be very useful when you can't get physically close to the subject. Note that there are two important limitations on using the digital zoom: you can't use it when shooting 4K, and you can't use it in the Slo-Mo mode. Like all GoPros, the Silver uses automatic exposure. You don't have the same fine tuning controls or even manual options of the Black, but you at least have a little control by being able to specify which part of the frame is used to calculate the automatic exposure. It's simple to use--you just touch the back screen on the part of the frame that you want to use for the basis of the automatic exposure control. It comes in very useful in shots where there's a wide dynamic range, or high contrast between highlights and shadows. An example might be if the sky is getting blown out (too bright) but you want to highlight some dramatic clouds, in which case you can touch the sky area on the back screen and the automatic exposure will be calculated using that part of the frame. Another example might be if a person's face is in shadow, so you can select their face in the frame and it should lighten the overall exposure by trying to correctly expose the face. 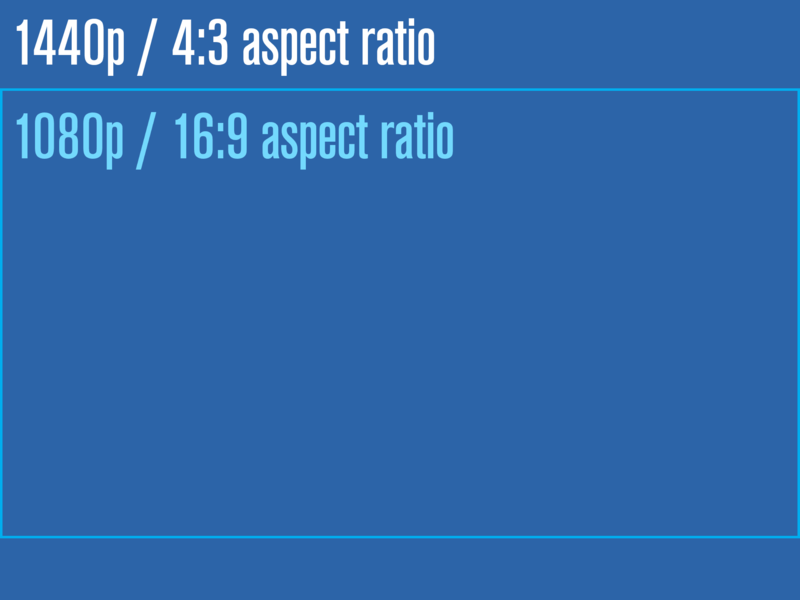 Note that exposure control is different to the exposure compensation that's available on the Black. Exposure compensation lets you set a value for under or over-exposing by a designated amount as a way to override the standard automatic exposure. The highlight tagging feature that the last several generations of GoPros have had is also available on the Silver. It lets you mark specific moments as they happen so that you can quickly reference them later when editing in the GoPro app or GoPro Studio (but not in other video editing apps). Highlight tags can be added on-the-fly in-camera, using the GoPro mobile app, or with the Smart Remote. This is a new feature that GoPro introduced with the HERO7 models. It lets you shoot 15 or 30-second clips that are designed for quick sharing online. All of the HERO7 models have it, including the Silver. This isn't a performance feature--it's a convenience feature, part of the effort to make GoPros easier to use. They're ideal for quick shots to share on social media. They can be shot in 4K or in the Slo-Mo mode. The Silver can record slow motion, sort of. It's a much more limited feature than on the Black. In this case, it records at 60 frames per second and plays back at 30 frames per second. It's half speed, or 2x slow motion, which is not especially dramatic. So the feature is there, but if you need more powerful slow motion options you'll be wanting to look at the higher models such a the Black. It's only available in the 1440p resolution. To use the Slo-Mo feature, tap on the snail icon on the back screen--it doesn't show up as a distinct shooting mode when using the GoPro mobile app. The Silver can do time-lapse video, which compiles the video in the camera and outputs it as an MP4 video file. The Silver's time-lapse video function is a little more powerful than the White's in that you can choose to save it as a 4K video or a 1440p (the White can only do 1440p), but you're still limited to the 0.5-second interval. You can't choose longer intervals like you can on the Black. There are several different ways you can control the video record button. The most obvious is to use the shutter button on the camera. You can also use voice control, the GoPro mobile app, or the Smart Remote or REMO remote. You can find the HERO7 Silver at Amazon and B&H Photo. 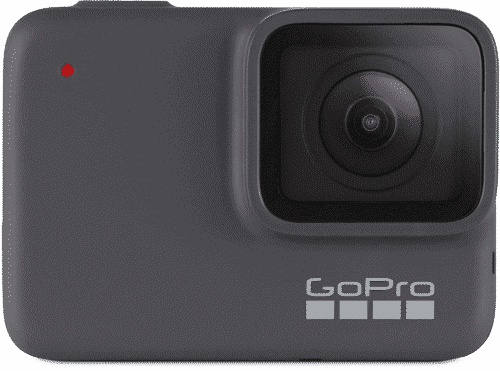 If you buy directly from GoPro.com, they're throwing in free 2-day shipping and a memory card. * Not every feature is available in every shooting mode. As examples, video stabilization is not available in every resolution/framerate combination and the option to save RAW images is not available in burst mode.